After forging a formidable reputation for itself in the global market with conventional notebooks and tablets, Lenovo has taken a fresh leap into Android tablet segment and has launched two new tablets dubbed the Yoga Tablet 8 and Yoga Tablet 10. Much like other Yoga devices in Lenovo's line-up, the Yoga Tablet 10 features multimode design and can be used in different 'modes'. The Chinese giant has been touting the Yoga tablets as the company's biggest launch of the year and also hired the Hollywood actor Ashton Kutcher as Lenovo's 'product engineer'. 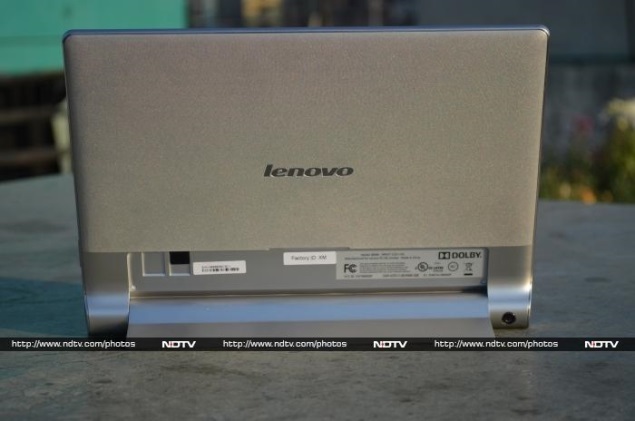 But can the combination of decent hardware, revamped tablet design with sleek form factor and a Hollywood actor make this the turnaround vehicle for Lenovo's tablet segment in India? We try to find out in our review. We have always been fascinated by new form factors in devices. Which is why we were so interested in reviewing the Lenovo Yoga tablet. As far as looks go, Lenovo's Yoga Tablet 10 is a complete departure from the tablet norm and features a cylindrical end design at one end, which is reminiscent of a folded magazine (like the Sony Tablet S), while the other end has a sleek profile. The company has been promoting the Yoga tablet's cylindrical design as being more user-friendly when compared to other conventional tablets. While using the Lenovo Yoga Tablet 10, we experienced that the cylindrical design at one end made it easy to grab and move the tablet around. Further, while using the tablet in portrait mode, the Yoga Tablet 10's cylindrical design was more comfortable to hang on to with the left hand, for example for when reading eBooks or for browsing on the tablet. It took some time for us to get used to the tablet's cylindrical end, though after that period it was quite easy to use the 10-inch tablet with one hand, at times (not always though). However, the tablet does feel a tad heavy at the bottom when using the Lenovo Yoga Tablet 10 in landscape mode and after a point of time; it doesn't balance well in the hands. At around 600 grams, the Lenovo Yoga Tablet 10 is heavy when compared to some 10-inch counterparts. The Chinese major is touting Yoga Tablet 10's multimode design, offering three modes to work - hold, tilt and stand. The tablet's cylindrical end shape is responsible for these modes. Doubling up as a hinged stand that can be folded back at the back of the tablet, enabling stand mode. Second is tilt mode, which refers to placing the tablet on a surface with the cylindrical end offering a tilt shape for users to work. The last is the hold mode, which apparently means holding the tablet by the rounded end. We must confess that we used all the three modes of the tablet, and were impressed with the modes. When compared to normal tablets, a user has to buy separate covers or cases, to use the tablet in these different modes. 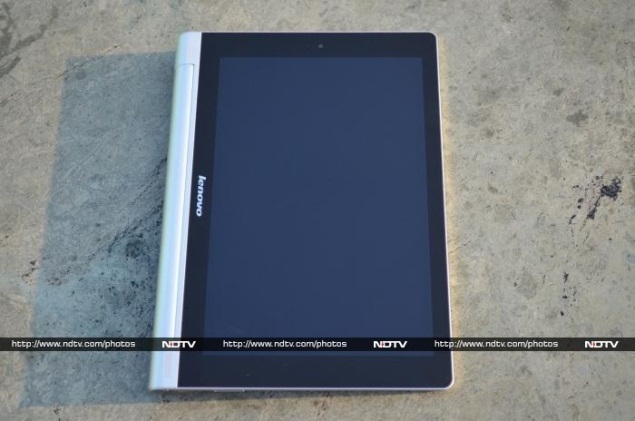 Lenovo Yoga Tablet 10 includes both the aluminium and plastic material in build. The company has smartly used the aluminium on the hinge stand and also at the edges giving tablet a premium look; although in another places the Yoga Tablet 10 is built of plastic material. The rear panel of Yoga Tablet 10 features textured plastic material which doesn't help much in gripping the tablet. The front panel houses dual speakers at the bottom, (when using the tablet in landscape mode) near the edges on the cylindrical end of the Yoga Tablet 10. One can find the Lenovo logo branding on the front as well as back of the Yoga Tablet 10. The front panel is dominated by the 10.1-inch display with no physical buttons. There is a 1.6-megapixel front-facing camera at the top of the display (when using the tablet in portrait mode). 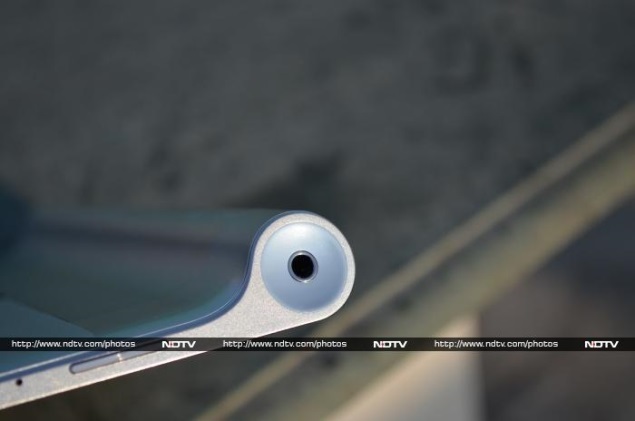 At the back of the Yoga Tablet 10, one can find the 5-megapixel rear camera embedded on the cylindrical end, which at times gets accidentally covered while clicking images. We wish Lenovo could have placed the primary camera of the tablet somewhere else. Another interesting feature of the Lenovo's Yoga Tablet 10 design was the power button, which has been built-in the cylindrical end of the tablet at one end, while the other end houses the 3.5mm audio jack. We must confess that Yoga Tablet 10's power button is the biggest ever we have seen on a tablet in terms of size. We had no problems in hitting the power button, sometimes even when not looking at the tablet, thanks to the placement. The top of the tablet houses the Micro-USB charging port, while the volume rocker buttons are placed at the bottom, when using the tablet in portrait mode. Overall, the Lenovo Yoga Tablet 10 as a package exudes power and sturdiness in terms of design. 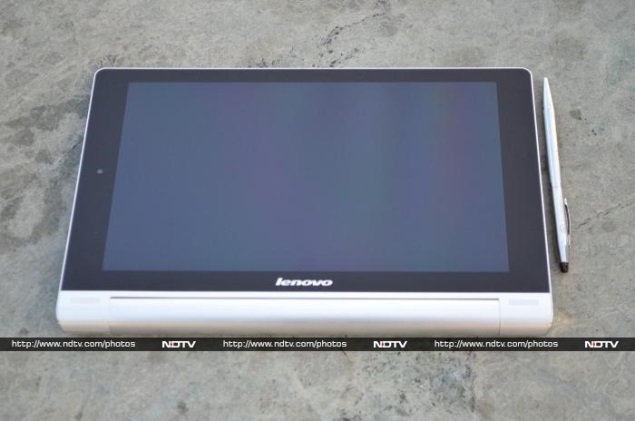 Lenovo may have spent a lot in terms of R&D for the new Android Yoga Tablet 10 but unfortunately, much of that effort goes in vain due to the display of the tablet. When we first time switched on the tablet, the 10-inch display was a let-down. At 1280x800 pixels resolution, the Yoga Tablet 10 display offers a pixel density of just 149ppi. The resolution and pixel density of the Lenovo Yoga Tablet 10 is far lower than some of its 10-inch tablet competitors such as the year-old Nexus 10 that offers a resolution of 2560x1600 pixels or the Apple's new iPad Air which offers 2048x1536 pixels. However, the prices of both the Nexus 10 and iPad Air are way above the price of Lenovo's Yoga Tablet 10. 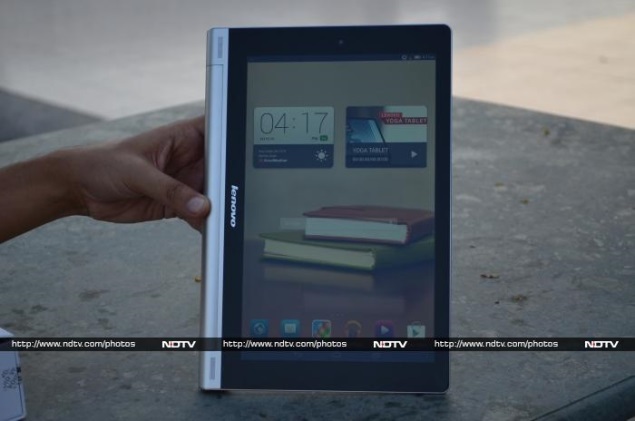 There is no doubt that Lenovo has chosen to compromise the screen of the Yoga Tablet 10 to bring down the price. Further, the Yoga Tablet 10's display is a let-down by its colour reproduction, which is not particularly accurate and the colours appear washed out. We were also surprised to see the Yoga tablet's homescreen icons looking a little blurred. The Yoga tablet's screen is very reflective and this hampers visibility under the sunlight and also due to the low resolution of the screen, images and videos played on the tablet appear less sharp. The company has equipped an IPS LCD technology on the Yoga Tablet 10's display, which does help in viewing angles. The Lenovo Yoga Tablet 10 sports dual cameras - a 5-megapixel rear camera and a 1.6-megapixel front-facing camera. 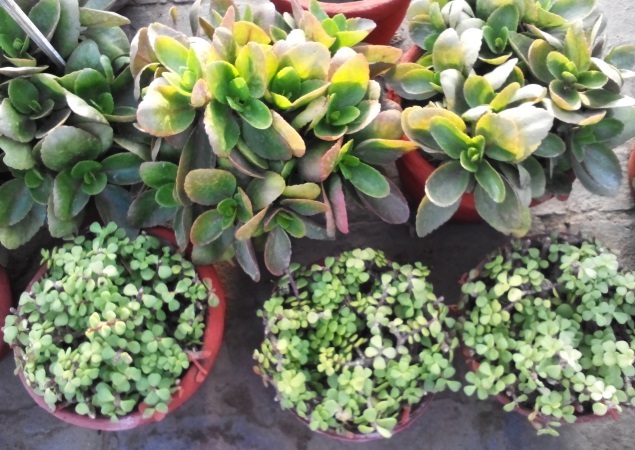 In our testing of the Yoga tablet's rear camera in outdoor, dim and indoor environments, we found that picture quality was average. 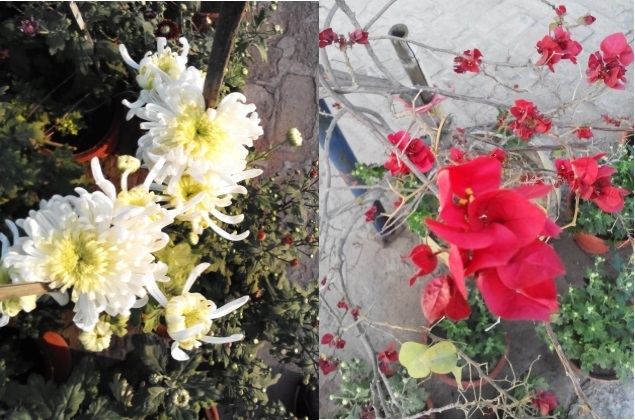 The clicked images were a bit washed out and grainy at edges. They were nowhere near to a smartphone picture quality. The Yoga Tablet 10's camera disappoints while clicking low-light shots, which had a lot of noise. The Yoga Tablet 10's camera app takes few seconds to start, with another few seconds for the auto-focus to set-off. At times, we noticed the shutter speed was comparatively slow than the Android tablets, which means this will not take pictures in a pinch. Users can choose from a host of camera settings on the Yoga Tablet 10, like face detection, self timer, ISO, exposure, colour effects, scene mode and white balance. It also offers a burst mode, letting users click 40 to 99 shots at once; users just need to long-press the camera soft key on the display to take burst shot. 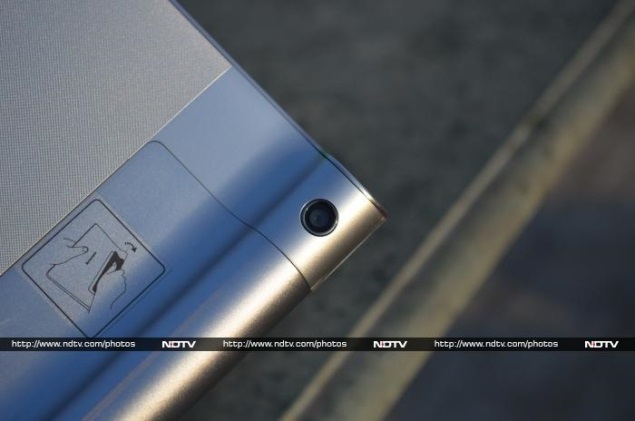 Lenovo claims that the Yoga Tablet 10 is capable of recording videos at full-HD quality. Though due to lack of details and a lot of noise, the Yoga tablet's recorded videos were no were near to the full-HD quality we'd normally expect. The Yoga Tablet 10's front facing 1.6-megapixel camera is pretty decent, when compared to the primary camera. We were impressed with quality of some selfies that we clicked. It can be used well for video calls. The Lenovo Yoga Tablet 10 runs Android 4.2.2, which seemed to be the OS of choice in Android based tablets in the country until few months. 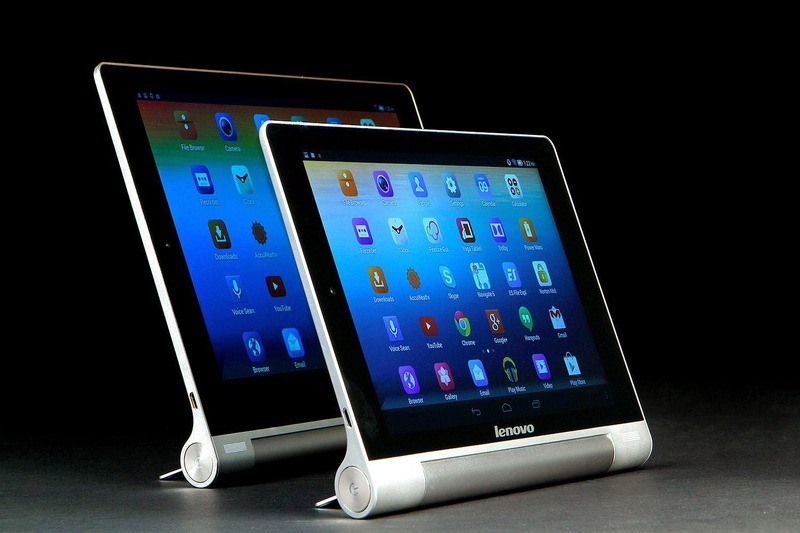 However, we expect Lenovo to soon rollout the Android 4.3 Jelly Bean update for the Yoga tablet. Considering that the company has positioned the Yoga Tablet 10 as its biggest launch of the year, we assume that the Chinese major might even think of skipping the Android 4.3 Jelly Bean update and directly release the Android 4.4 KitKat update for the Yoga tablet. 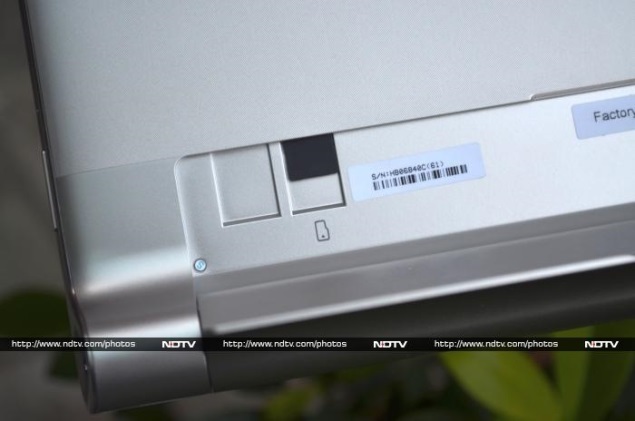 Talking about the Yoga Tablet 10's interface, Lenovo has given it a complete overhaul, which we feel is more inspired by Apple's iPad tablet interface. When we first unlocked the tablet, we found three homescreen panes filled with apps. It can include up to seven homescreens. After spending some time with the Yoga Tablet 10, we realised that Lenovo has removed the main menu which houses various apps and widgets in Android tablets. We even struggled to find apps when required, due to lack of menu view and at times had to use Google to search for pre-installed or downloaded apps on the tablet. Thankfully, the new downloaded apps on the homescreen panels sport a 'New' tag until, someone opens the app for the first time. Next thing we noticed in the Yoga Tablet 10 was the oversized app icons, which looked blurred. We tried to fix the issue by reducing the app icon size but couldn't find a way to change it. Due to the large-sized app icons, we experienced some confusion at times. When we downloaded the Temple Run and Temple Run 2 on the Yoga Tablet 10, instead of showing the full name of the later app, it only showed Temple Run for both the apps. Further, Lenovo has completely skinned UI elements of the operating system on the Yoga Tablet 10. The tablet offers four themes that come with different icon set but even the default theme on the tablet that offered stock icons has undergone some minor tweaks with Lenovo choosing a circled icon look instead of the plain that is being offered on stock Android. At the bottom of the Lenovo Yoga Tablet 10's display one can find apps for default browser, email, gallery, Play Music, default video player, and Google Play store. These apps remain fixed at the bottom on all homescreen panels. 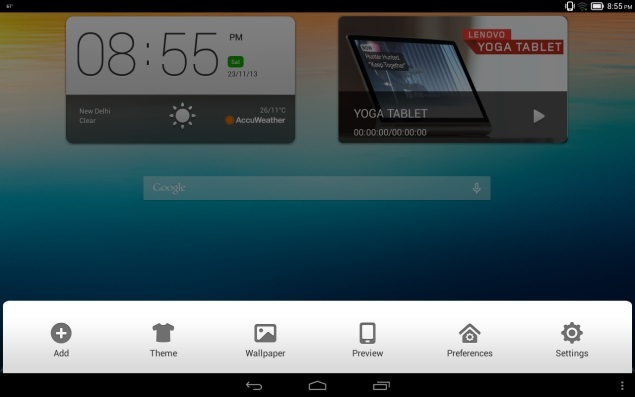 One can get lock-screen widgets on the Yoga Tablet 10, which is an Android 4.2 feature. This Android 4.2 Jelly Bean feature enables users to perform certain app actions even when the device is locked. Surprisingly, Lenovo has removed the option to directly launch the camera app from the lockscreen of the Yoga Tablet 10, a feature we have seen on all Android tablets. While unlocking the device one can choose from the calendar, Gmail, Google Now, and Google+ posts. 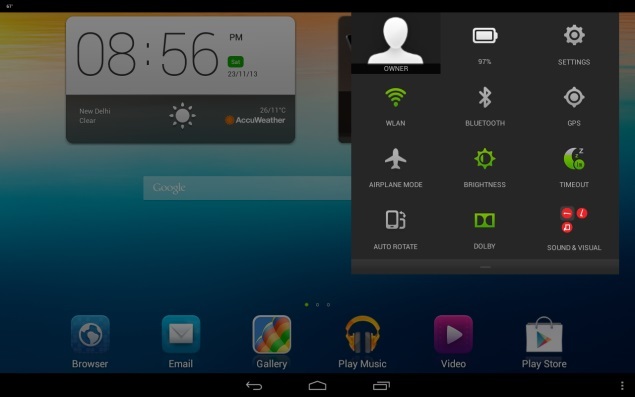 Similar to other Android 4.2 Jelly Bean-based devices, the notifications tray on the Yoga Tablet 10 features a settings shortcut and a clear all button. The Yoga Tablet 10 much like other Android 4.2 tablets come with two separate notifications tray - one with Quick settings and other with email, messages, and other alerts. On expanding the Quick Settings notification tray on the Yoga Tablet 10, one can find options for quick access to the owner's profile, battery status, settings shortcut, Wi-Fi, Bluetooth, GPS, airplane mode, brightness, screen timeout, auto rotate, Dolby and audio profiles for three modes - namely hold, stand and tilt modes. The Lenovo Yoga Tablet 10 also comes with Google Now, an Android 4.2 feature which is a voice-based information assistant and an extension of Google search. It uses cards which are essentially small boxes that offer different sets of information like weather forecast, directions, traffic information, scores, appointments and currency conversion etc. The Yoga Tablet 10 also includes three dots at the bottom right panel, which opens a new tray that includes tablet themes, wallpapers, preview, preference and settings. Users can add or remove apps from the tray. We were a bit surprised to see the limited number of apps preloaded on the Yoga tablet 10. Some of the apps pre-installed on the tablet include Norton Mobile for warding off virus and malware attacks; Navigate 6, a navigation app; AccuWeather, an app to track the weather conditions; SHAREit, an inter-tablet content transmission app; Kingsoft Office Suite, for creating and editing MSOffice files, and Skype for having video calls over Wi-Fi. However, the Norton Mobile app is not completely free and users need to pay for using the premium features of the app. The Lenovo Yoga Tablet 10 also comes preloaded with host of Google apps such as Gmail, Google Search, Google+, Hangouts, Google Maps, Play Books, Play Movies and TV, Play Store and YouTube. The Lenovo Yoga Tablet 10 is powered by a quad-core MediaTek chipset (MT8389) clocked at 1.2GHz along with 1GB of RAM. There is 16GB of inbuilt storage, which is further expandable up to 64GB with the help of microSD card. Without any doubts, the Lenovo Yoga Tablet 10's specifications sound quite acceptable on paper. But unfortunately, the same is not the case in real life performance. We found the tablet lagging in launching some apps. Admittedly, the lag is not that consistent but considering that a quad-core processor backs the Yoga tablet, it is quiet disappointing. At a time when tablet manufacturers are moving towards more serious architecture and choosing Qualcomm, Exynos and Nvidia chipsets to power the devices, Lenovo has chosen MediaTek. The company has clearly compromised the hardware for keeping price of the Yoga tablet as low as possible. Thankfully, the touch experience was good on the Yoga Tablet 10. We played some of our favourite games on the Yoga Tablet 10, including Temple Run 2, Subway Surfers, Dead Trigger, Vector and Shadow Gun, the tablet fared well, except for some odd lags at times, Overall, we got an acceptable gaming experience. However, the biggest compromise for playing games for longer periods on any device, a tablet or a smartphone, is the battery backup. But thankfully, the company has equipped the Yoga Tablet 10 with huge 9000mAh battery and that delivers. The Yoga Tablet 10 in our rundown video playback tests lasted for more than 8 hours of continuous video playback. The company claims that the Yoga Tablet 10 can deliver up to 18 hours of browsing, although we couldn't test this. The Yoga Tablet 10 was able to playback all popular formats including MKV, MP4, MOV and AVI. Further, the tablet played full-HD videos with minimal fuss and thanks to the 10-inch large screen size, watching movies is a pleasure. Lenovo has not included its music player, but has instead decided to stick with Google's own Play Music app. The music player does not come with too many tweaking options but offers acceptable experience through earphones/ headphones. Unfortunately, we cannot say the same for the dual-front speakers. The dual speakers are powered by Dolby Sound but give average sound quality. 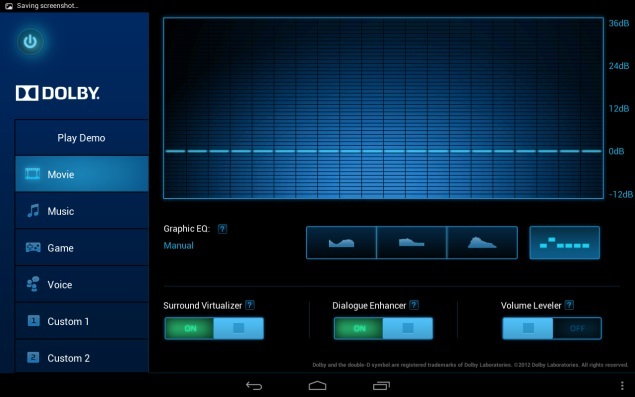 We played some music on the Yoga Tablet 10 through the speakers, and at loud volumes the sounds seemed to break. As mentioned earlier, the Lenovo Yoga Tablet 10 packs a large 9000mAh battery and in our usage, it easily lasted for more than a day. We charged the tablet in the morning, and with medium to heavy usage, including notifications for two email accounts configured, listening to some music, long hours of gaming (Temple Run 2, Skiing Fred, Plants Vs Zombies2 and Shadow Gun), taking some casual photographs and chat notifications, the tablet lasted for almost a day, with at least 30 to 40 percent battery still left. It's worth pointing out that we had turned on Wi-Fi and the display was set on to full-brightness. Changing these settings may help in increasing the phone's battery life, depending on your usage pattern. In terms of battery backup, we can safely say that the Lenovo Yoga Tablet 10 is one of the best in the segment. There is no doubt that Lenovo has put in a lot of thought in the whole design of the tablet, making it stand out from the routine crowd. Additionally, it's worth pointing out that Lenovo's Yoga Tablet 10 multimode feature includes those modes, which generally require a separate cover or a stand for a tablet. 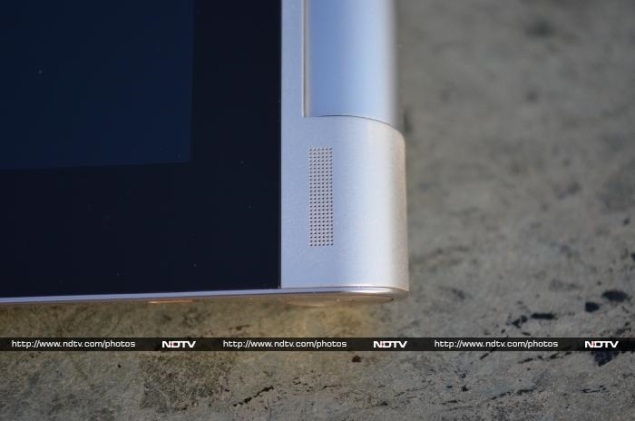 While it does live up to what Lenovo's Yoga line-up is known for (multimode design), we feel that a better chipset and a higher-resolution display could have helped the cause. 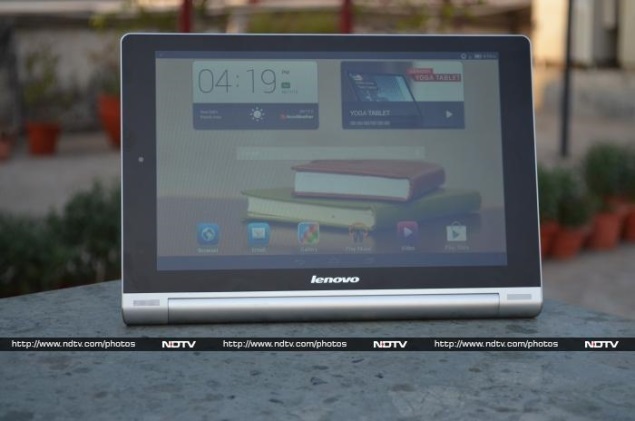 In our opinion, the Lenovo Yoga Tablet 10 delivers in some departments though disappoints completely in others. And while everything generally worked well on it, we did experience the odd lag, making us wonder whether the MediaTek's quad-core processor was a good choice by the company. Another deal breaker is the Yoga Tablet 10's display, being a 10-inch device with a display sporting lower screen resolution looked awful, we admit. 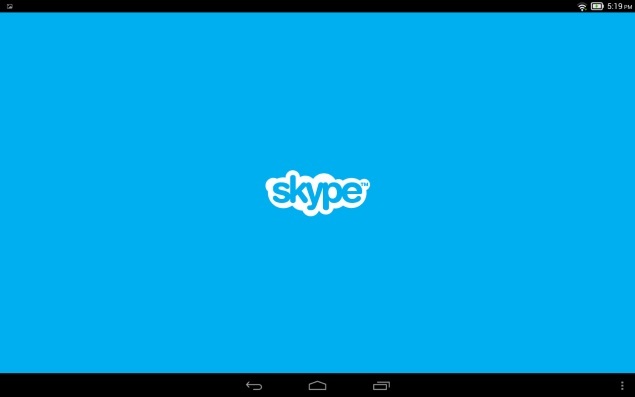 The company has made changes to the UI of the tablet, but that too does not help much in the overall experience. Further, the tablet sports dual front loudspeakers but the sound experience was not that great. At Rs. 28,999 for the 16GB and Wi-Fi + 3G edition of the Lenovo Yoga Tablet 10 is priced decently. Those looking for alternatives can look for the Apple iPad 2, which is a dated device but offers a better package. In case, one wants a refreshed tablet can also go for the Apple iPad Mini with Retina Display which is expected to be launched in India next week at a price of Rs. 28,900 (16GB), or for those who want a 10-inch tablet, the Wi-Fi only Apple iPad Air, which is also expected to launch next week at an price of Rs. 35,900 (16GB).